Considered by many the fathers of contemporary American liturgical music, these young Jesuit seminarians began composing in the early 1970s in the wake of the Second Vatican Council. This classic, early album from the St. Louis Jesuits gave the Church some of the group''s most popular songs, including "Behold the Wood," Only in God," and "Glory and Praise to Our God." Their third collection, released in 1976 through North American Liturgy Resources (NALR), it offers music of praise and inspiration for our lives, rooted in the love of Christ. Originally released in 1975, Earthen Vessels was the second album from the St. Louis Jesuits; it continues to be one of the best-selling albums of Catholic music ever recorded. Now you can discover once again how the Holy Spirit inspired five young men to create extraordinary music that would enjoy a cherished place in the hearts of generations of Christians around the world. This unique anniversary edition features five never-before released tracks from the group's original recording sessions in 1974. Dubbed playfully as "the Berkeley Basement Tapes," these tracks offer a rare glimpse into the creative process of this influential music group. Interestingly, these then-new songs are already in the form and arrangement in which they were eventually released, almost as if they burst forth whole from the composers. The vocals on these tracks are an amazing testimony to how well their voices blended, even at this early stage of their career: the trademark harmonies, the detailed guitar lines—it's all here. With its familiar track sequence, this commemorative collection of Earthen Vessels demands that the listener hear the album in its entirety. Think of it like a mini-retreat. Some Catholics will hear this album and be transported back to a time when they were coming of age in their relationship with God. Youth today who have heard parish choirs sing these songs can now experience them as the composers intended. This special anniversary edition also includes a 24-page booklet with rare photos of the young Jesuits and the story of the making of Earthen Vessels, written by historian Ken Canedo. As Ken concludes, "We hold a treasure, indeed!" This 40th anniversary CD offers 15 remixed and remastered songs for Advent and Christmas from the beloved St. Louis Jesuits. This album features revised choral editions of twelve popular songs by the St. Louis Jesuits. Many of the titles have new keyboard, instrumental, and SATB arrangements. These definitive editions, created with the help of the composers, lend an even greater richness and flexibility to these enduring favorites. Newly revised choral editions of twelve popular songs by the St. Louis Jesuits. Many of the titles have new keyboard, instrumental, and SATB arrangements. These definitive editions, created with the help of the composers, lend an even greater richness and flexibility to these enduring favorites. This popular collection offers an inspirational reflection on the seasons and events in the Christian life. Released in 1980, Lord of Light is the fifth collection of music produced by the St. Louis Jesuits. It's one of their all-time best-selling albums, second only to Earthen Vessels. Includes "Here I Am, Lord," "Redeemer Lord," "This Alone," "City of God" and other early favorites. The album contains revised choral editions of twelve popular songs by the St. Louis Jesuits. Many of the titles have new keyboard, instrumental and SATB arrangements. These definitive editions, created with the help of the composers, lend an even greater richness and flexibility to these enduring favorites. Includes the St. Louis Jesuits Mass (Holy, Memorial Acclamation C, Doxology and Amen). Their first new collection in 20 years! Twenty years after releasing their last collection, the St. Louis Jesuits are back! Composers of some of the most beloved liturgical music ever written, the group -- Tim Manion, Dan Schutte and Jesuit Fathers Bob Dufford, John Foley and Roc O'Connor -- has come together to produce Morning Light, a reunion collection of hope-filled songs for Sunday liturgies, funerals, retreats, prayer services and other celebrations. Featuring 12 newly written songs, three by each member of the group (except Manion), this collection proves they still have it. They still have that uncanny ability to set Scripture-based texts to beautiful, accessible, innovative melodies that fit and enhance the liturgy -- and touch the hearts of today's worshipers. But this is no copy of their previous work. Reflecting 20 years of spiritual and musical growth, these new compositions have a depth, maturity and humility that modern assemblies will appreciate. Of course, the world around them has also changed. Concerned for the "dark clouds" and discouragement they see, the group determined to write music filled with "the hope we have been called to." "Behind and Before Me," by Bob Dufford, is an exquisite setting of Psalm 139. Spiced with well-balanced parts for guitar, flutes, strings and choir, it reassures us of God's intimacy -- and recalls our limited ability to grasp it. Opening with a lovely prelude for trumpets, "Teach Us to Pray," by John Foley, invokes the Holy Spirit's help in prayer and all we do. Inspired by Romans 8, this simple hymn is a timely reminder that "all things work for good." Suitable for gathering, preparation of the gifts, Communion, sending forth and other parts of the liturgy, the songs cover a variety of themes, including trust in the Lord, discipleship, light, hope, love and praise. Highlights include "Gather the People," by Dan Schutte. A spirited, syncopated entrance hymn, it builds slowly toward a grand, full-choir finale that can't help but draw the entire assembly -- "the greatest and the least" -- into full participation. Featuring gentle violin and acoustic guitar parts and based on a text by St. Augustine, "O Beauty, Ever Ancient," by Roc O'Connor, challenges us to find renewal and "new life" in God. Recorded with an excellent choir and impressive keyboard, wind, percussion and string accompaniment, the CD makes for inspirational and prayerful listening, besides being an excellent rehearsal tool. The composers take turns on lead vocals. Though not contributing to the composing effort, Tim Manion lends his familiar voice and plays guitar on nearly every song. Just as sunlight in the morning dispels the darkness of night, so Morning Light uplifts and encourages -- through both text and melody -- offering hope in a sometimes dark and troubled world. Infused with the genius, faith and maturity of these legendary composers, it's destined to be yet another in their long line of classic and best-selling collections. Now available in a remastered 2-CD set, Neither Silver Nor Gold is the debut album from the popular St. Louis Jesuits. Released in 1974 through NALR (North American Liturgy Resources), the four-album set was just the beginning for these young songwriters and seminarians at St. Louis University. Immediate demand for the collection launched the group to international success. Their scripture-based texts and singable melodies greatly influenced the world of liturgical music for decades. 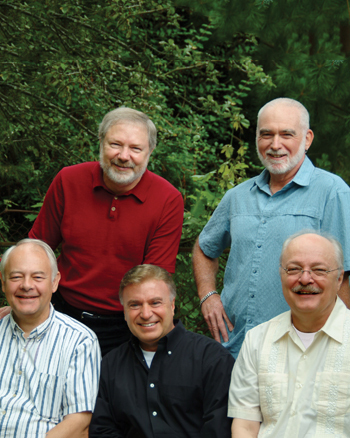 Bob Dufford, John Foley, Tim Manion, Roc O'Connor and Dan Schutte started composing and singing liturgical music while completing their studies as young Jesuits at Saint Louis University in the early 1970s. They released this first recording and songbook in response to numerous requests from fellow students and worshipers at St. Francis Xavier College Church and Fusz Memorial Chapel. This charming collection of 46 inspirational songs was originally recorded on primitive equipment in campus buildings, church basements and dorm rooms at Saint Louis University. On some songs, you can hear a refrigerator door clicking shut in the background when the room's occupants go for refreshments. As a result of this collection's great success, the group has recorded six additional albums (Earthen Vessels, Dwelling Place, Gentle Night, Lord of Light, The Steadfast Love and Morning Light) in far more professional studio facilities. The beloved songs in this classic collection include psalms, hymns and canticles performed in an original folk-music style, among them "Sing a New Song," "All My Days" and many other early favorites. Whether you're singing along or just listening to these wonderful tunes, you'll find the natural faith of the St. Louis Jesuits bringing your heart closer to God. Released in 1985, The Steadfast Love is the sixth collection by the St. Louis Jesuits. These classic songs of striking beauty and sophistication combine Scripture and melody to challenge, inspire and comfort. The 22 songs include "Sing All the Earth," "My Spirit Takes Joy" and "The Steadfast Love." What Wondrous Love is a collection of piano improvisations on well-known hymns that can help you relax and achieve a focused, prayerful mind. The quiet power and depth of Val's musical interpretations will come as no surprise to those of us who already know him as Grayson Warren Brown's arranger and accompanist. Whether the style is contemporary, traditional or Gregorian, Val's exploration of the melodies and harmonies of some of our most popular hymns carefully maintain the distinctiveness of the original melody. What Wondrous Love can be a valuable instrument of God's peace for your listening and devotions. This classic, seasonal collection is a complete anthology of music for Advent and Christmas. Released in 1977, Gentle Night is the fourth collection of music by the St. Louis Jesuits. It contains some of their most beloved and treasured works, including "Patience, People," "Children Run Joyfully" and The Beautiful Mother." This popular collection offers an inspirational reflection on the seasons and events in the Christian life. Released in 1980, Lord of Light is the fifth collection of music produced by the St. Louis Jesuits. It''s one of their all-time best-selling albums, second only to Earthen Vessels. Includes "Here I Am, Lord," "Redeemer Lord," "This Alone," "City of God" and other early favorites. This 40th anniversary MP3 album offers 15 remixed and remastered songs for Advent and Christmas from the beloved St. Louis Jesuits. This is the MP3 playlist for Let Heaven Rejoice. Now available as a digital playlist, Neither Silver Nor Gold is the debut album from the popular St. Louis Jesuits. Released in 1974 through NALR (North American Liturgy Resources), the four-album set was just the beginning for these young songwriters and seminarians at St. Louis University. Immediate demand for the collection launched the group to international success. Their scripture-based texts and singable melodies greatly influenced the world of liturgical music for decades. At the time of change following the Second Vatican Council, parishes were hungry for a new kind of music to encourage the full, conscious and active participation of the faithful. As young Jesuit seminarians at St. Louis University in the 1970s, Bob Dufford, John Foley, Tim Manion, Roc O'Connor and Dan Schutte felt called to respond. The result: “Be Not Afraid,” “Here I Am, Lord,” “One Bread, One Body.” Known and loved the world over, these and other classic songs have been staples in Catholic worship ever since. The St. Louis Jesuits released their first collection, Neither Silver, Nor Gold, in 1974. People discovered that their guitar-based folk melodies and clear, Scripture-based lyrics were an enduring way to pray in song. The group received Grammy nominations in 1976, 1977, 1978 and 1981. After releasing many best-selling collections as a group, the five began to work independently, with several releasing solo albums. In 2005 OCP published Morning Light, a new collection from the group, as well as Thirty Years: The St. Louis Jesuits, a beautifully designed coffee table book highlighting their fascinating story.In the fall of 2017, OCP celebrated the 40th anniversary of their classic Christmas album, Gentle Night, with a beautifully remixed and remastered commemorative edition. Jesuit Father Bob Dufford recently completed service at the Jesuit Retreat House in Oshkosh, Wisconsin; Jesuit Father John Foley is currently Editor in Chief of the Saint Louis University Sunday Web Site; Tim Manion continues to compose folk music in the Seattle area; Jesuit Father Roc O’Connor is Associate Pastor at the Church of the Gesu, a Jesuit parish in Milwaukee, Wisconsin; and Dan Schutte is composer in residence at the University of San Francisco.